Passionate individuals, businesses, community players and schools are all heading to the finals of the Northumbie Awards 2018 tonight (Thursday), to be rewarded for their special efforts celebrating the second Northumberland Day. The presentation evening at Langley Castle Hotel has attracted not just those shortlisted for awards, but also those wanting to find out more about participating in 2019 and plans for next year. A shortlist of finalists has been named by the Northumberland Day organisers, with each one already a winner having made it this far. There are seven Northumbies up for grabs this year, thanks to sponsorship from Newcastle International Airport, Hexhamshire Brewery, Langley Castle Hotel and Restaurant, The Angel of Corbridge, event listing and ticketing website, Justbookitnow.com, Helen Grierson Glass Studio and Catapult PR. Best Community Event: Beadnell Village, Haydon Bridge Village, Headway Arts, Norham Village. The Jill Bradbury Award for Most Passionate School: Allendale Primary School, Mowden Hall School, Wooler Primary School. The Best Foodie Event or Initiative: The Angel of Corbridge; Melanie’s Tea Rooms, Newbiggin; Taste of Northumbria, Alnwick. The Most Passionate Pub, Restaurant, Café or Tea Room: The Angel of Corbridge; The Craster Arms, Beadnell; Melanie’s Tea Rooms, Newbiggin. The Best Designed Event: Beadnell Village; Dawn Chorus Walk, the Friends of Ridley Park; Headway Arts, Blyth; Northumberland Rocks Treasure Hunt; Taste of Northumbria. The Just the Ticket Award: The Angel of Corbridge, Beadnell Village, Headway Arts, Melanie’s Tea Room, Kirkharle Courtyard, Taste of Northumbria. The Above & Beyond Special Recognition Award: Katie Archer, Beadnell; John Emery, Ashington Rocks; George Shiel and Ailsa Campbell-Shield, Golden Gate Boat Trips. 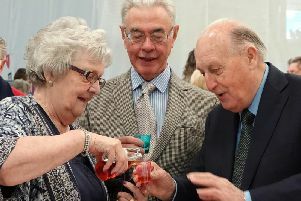 Northumberland Day organiser, Jane Hunt, said: “We have seen some amazing celebrations this year, which is why everyone who told us about an event will receive something to mark their hard work and participation. Tickets for the event cost £5 and can be bought at www.justbookitnow.com - the website of one of the Northumbies’ sponsors. Proceeds will go to the Great North Air Ambulance.